As the reader passes the corner of Wallace Place and Warren Street, his attention cannot help very well from being called to the massive buildings in which, if he makes inquiry, he will be told is housed the great primary educational interests of the hundreds who make St. Joseph's Church their religious home. 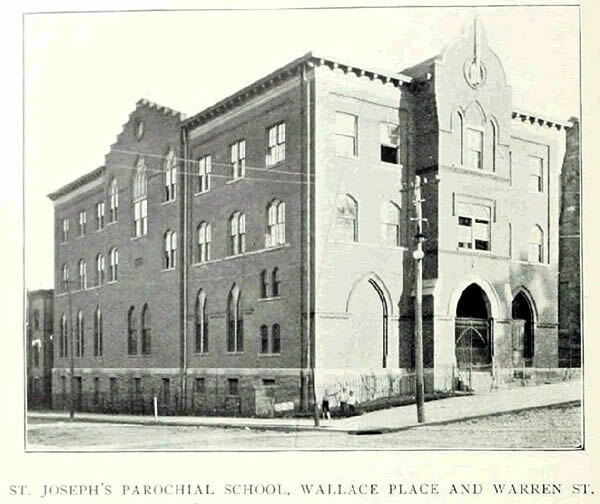 Those buildings to which we refer being none other than those pertaining to St. Joseph's Parochial School, the largest Catholic school in the State of New Jersey. Like all other schools under the care of the Catholic Church, every care is sought to be taken, not alone to have the children thoroughly well educated in all the secular branches of learning, but also that the pupils under their instruction shall also be well rooted in spiritual affairs, it being a cannon of the Catholic Church that learning, both secular and religious in character, shall go hand in hand in life's journey.